CHUO aims to provide the community with the equipment, skills and resources to create and produce radio programming. We rely on the community’s generosity do so, and are reaching out for your pledge. 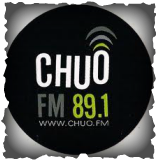 Your support allows CHUO to continue exposing the region’s radio listeners to the music that the commercial radio just doesn’t play, giving a voice to cultural and community groups within the National Capital Region. Funding Drive, held this year from October 19 to 25, 2015, is perhaps the best way for listeners to become part of CHUO. This activity is designed to unite all members of the station in the common goal of acquiring funds to update and modernize the CHUO website (www.chuo.fm), but also to keep the station in operation. CHUO is a non-profit organization and it’s important to recognize that although we are not here to make money, we do need a certain amount of money to continue broadcasting quality radio. Donation = Gift to you! With every donation of $15 you will receive the "CHUO Card" as a gift which lets you enjoy various discounts at many businesses across the region - from restaurants to theatres - a prize worth more than a mere $15.00 donation. ​For other donation incentives, please visit our STORE and choose your own GIFT!